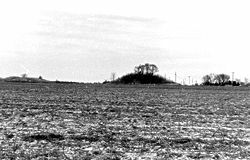 Two prominent flat-topped rectangular mounds are present at the Jaketown site. Mound B, the largest, measures about 150 by 200 feet at its base and is 23 feet high. On its eastern side, a projecting bulge marks a ramp once used as a stairway. Mound C, northwest of B, is about 15 feet high. 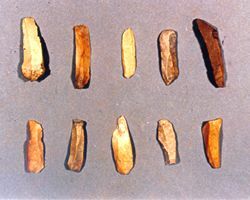 While neither mound has been excavated, distinctively styled pottery fragments found in the surrounding area indicate that the mounds are probably Mississippian period earthworks, dating to between1100 and 1500 A.D. Both mounds presumably had ceremonial temples or elite residences on their summits. Numerous smaller mounds at the Jaketown site, some of which may have dated to the Late Archaic/Poverty Point period (1500 to 1000 B.C. ), have been destroyed by plowing and highway construction. The two remaining large mounds described above are owned and protected by the state of Mississippi. The Jaketown Site is located on the west side of State Hwy. 7, about four miles north of Belzoni, Mississippi. There are no on-site visitor accommodations, and the mounds are covered with dense underbrush. For safety, the mounds should be viewed from the highway only.